Immerse yourself in Crete’s culture and cuisine on this full-day 4WD safari from Chania. Sample fine Cretan wines at a local vineyard, watch a demonstration of traditional knife making, then peek into an olive mill and learn about the island’s famous extra-virgin olive oil. Finally, indulge in a delicious lunch at a local tavern and taste typical Cretan specialties like seafood, feta cheese and savory pies. This is an amazing tour! So many great sites, the ride through the gorge is amazing, and the meal and the family who provided it is absolutely great! We only spent a week on Crete, and this was our favorite non-beach day! 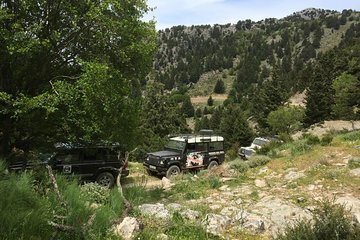 This tour was one of the highlights of our time in Crete. Super fun tour with super fun guides. The entire day was amazing but the highlight was having lunch with this amazing couple on a remote mountain village. Not at a restaurant. This was all home cooked food. Book this tour! Just do this. We spent 10 nights in Greece including Santorini and this was probably the highlight. Authentic, interesting, and our guide Petros was great. The meal in a tiny mountain village right along the road was incredible. it was prepared by a husband and wife, not a restaurant. A great overview of life on Crete. Worth every penny. Do not hesitate to book this!